Ancient Stones - Borders - 031 Yarrow Stone, Whitefield, Yarrow. This well-known early Christian monument stands 50m north west of the A708 Selkirk to Moffat road at a point about 1000m west of Yarrow Church, and close to the track that leads to Whitefield. It is an irregular, shouldered slab of whinstone, 1.35m in height as now set, 0.82m in greatest width and 0.35m in general thickness. The stone is surrounded by a wooden fence. It was turned up by the plough at the beginning of the 19th century and when this ground, then a moor known as Annan Street, was first brought under cultivation. It was then lying prone just under the surface and the remains of human bones were found underneath it. At this time there were about twenty "large cairns" on the moor. After having been removed to Bowhill for examination, it was returned to Annan Street and was erected at the place of its original discovery. The east face of the stone bears a Latin inscription, roughly executed and in parts badly wasted, which has caused much trouble to epigraphists. Little of the inscription on the east face can be made out. The stone is off the A708 Selkirk to Moffat Road, less than a mile from Yarrow village. It can be seen from the road, just off the farm track leading to Whitefield. Dumnogenus, in the tomb - two sons of Liberalis. A site like this always makes me wonder just what might have been in the forgotten past. In this small area we have the Yarrow Stone, the Glebe Stone stands only a few hundred metres to the east and another standing stone can be seen in the garden at Warrior's Rest, the name itself giving pause for though. There are also ancient linear earthworks to the west on Snouthead Hill and 20 large cairns are recorded to have once existed in the immediate area. 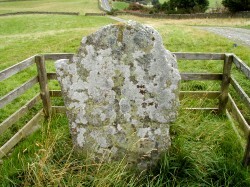 The stone itself marks the site of an important burial, of 6th Century British Christian chieftains and the site must have been an important and sacred place at one time. If you visit this place, just close your eyes and let your imagination wander. Beware, however, you may get more than you bargained for!